Soak in a hot tub for 20-40 minutes. This helps draw out toxins from your body when you are sick. It's great for clearing up congestion before bed too! 1. Combine broth, tomato, onion, bell pepper, garlic, cumin, chili powder, salt & pepper in a crock pot. 2. Cook on low for 8 hours or high for 4 hours. 3. Marinade the chicken, and grill just before serving. 4. Add the beans and hour before serving. 5. Chop the grilled chicken, and add it to the soup with the green onions & cilantro. Serve with shredded cheese, sliced avocado, lime wedges, and tortilla chips. 1. Rinse & drain the soaked almonds (allow to soak for at least 8 hrs). 2. Combine all ingredients in a high power blender (I use a VitaMix) and blend on HIGH for 1 min. 3. Place a fine mesh sieve over a large bowl. Then place a few layers of cheesecloth, or a nut milk bag (yes, this is a real thing, and I LOVE mine!!!) in the sieve. 4. Pour 1/4-1/3 of the almond milk in the cheesecloth and gently squeeze out the milk. Keeps in the fridge for 3-5 days. The milk will separate, so give it a good shake before drinking. You can use the ground almonds to make your own almond meal. Just spread it out on a parchment lined cookie sheet & bake @ 300 degrees for 1-2 hrs. Then grind in a food processor & store in a mason jar. Did you know that most sunscreens you buy from the store do more harm than good? While it's true that they may protect your skin from harmful UV rays that cause skin cancer, the chemicals in sunscreen can actually cause other forms of cancer (like breast cancer). Your skin absorbs these harmful chemicals, which causes cellular mutations and hormonal changes. Awesome, huh? Yeah...that's what I thought. How great that I've been spraying my kids down with liquid cancer! So on my quest to become healthier, I've been ditching chemicals in my life. I've already gotten rid of 95% of household cleaners, insect repellent, hand sanitizer, anti-itch cream/sprays for bug bites, and diaper ointment. Don't worry, I'll include the recipes for those gems too! When you make your own toiletries, it's important to buy organic ingredients. After all, we're trying to get rid of all harmful chemicals. 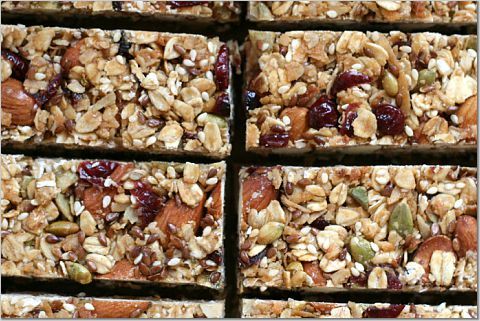 You can find most of these ingredients at your local health food store. I recommend this zinc oxide from Amazon. Just be careful not to inhale it when you mix it in. A little of this sunscreen goes a long way, so don't use too much or you'll have white streaks. 3. Once everything is melted, remove the jar and add your essential oils & zinc oxide. Stir until incorporated. 4. Pour immediately into the glass jar you will store the sunscreen in. 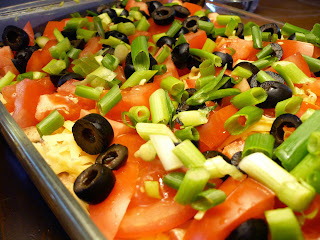 I love Mexican food & I love 7-layer dip, but I don't love all the fat & calories. Yesterday, I was mixing up a batch of my Vegan Black Bean Burgers and started eating it raw with chips. Then I had the great idea to make a dip out of it. Genius! I guarantee that this is the healthiest and yummiest 7-layer dip you will ever try! Happy Cinco de Mayo!!! 2. In a large pot, saute bell pepper & onion in oil until tender. 3. Add sweet potato, spinach, corn & black beans. Cook until everything is warmed through. 4. Stir in half the enchilada sauce, cilantro & green onions. 5. 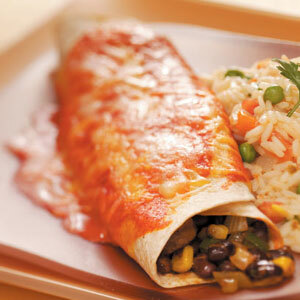 Spray a 9x13 casserole pan with cooking spray & assemble enchiladas and place in the dish. 6. Top with remaining sauce and top with cheese. 7. Cover with foil and bake for 20 minutes. Remove foil and bake 10 minutes more. 1. In a sauce pan, saute the onion in oil until tender. 2. Add garlic, and spices and cook for 30 seconds more. 3. Add sugar & tomato sauce. Simmer for 5 minutes. 2. Wash & julienne carrots, zucchini, bell pepper & onion. Toss with garlic, evoo, Italian seasoning, salt & pepper. 3. Bake for 10-15 minutes until tender but still al dente. 4. Meanwhile, cook the spaghetti according to package directions. 5. Reserve 1/2 c. of cooking liquid from pasta. 6. Drain pasta, toss in cooked veggies, tomatoes, parmesan, & pasta water. 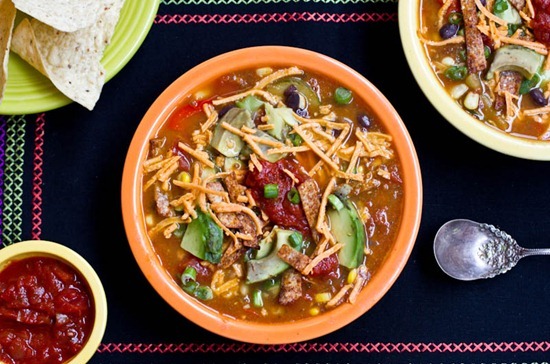 This lighter version of tortilla soup from Oh She Glows reminds me a lot of my Black Bean Tortilla Soup but without all the butter/cream/fat. My kids liked that it wasn't as "spicy" as my version. Guess I'm still learning how to tone things down for kidlets. 1. Saute onion & bell pepper in evoo over medium-high heat until tender. About 5 minutes. 2. Add zucchini, garlic, green onions & cook 2 minutes more. 3. Add corn, cumin, tomatoes, stock, & black beans. Bring to a boil, then reduce heat and simmer for 20 minutes. 4. Season with salt, pepper, & red pepper flakes to taste. Turn off heat and add lime juice. Made these last night after getting over the flu. They are moist and delicious, and not too sweet. Perfect. 2. Combine all ingredients in a food processor and blend until smooth. 3. Line a muffin tin with paper liners. Spoon batter into each. Bake for 15 minutes. I was a little late after running errands today so I needed something quick to fix for dinner. 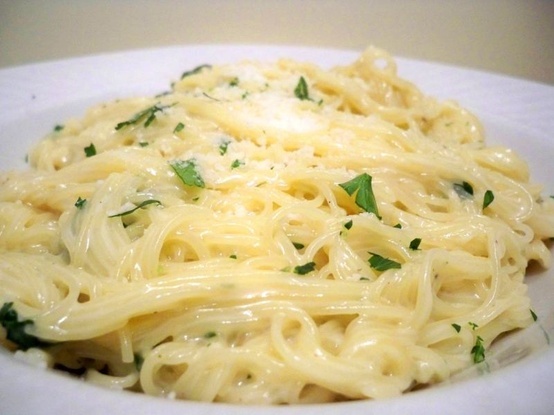 This pasta took less than 20 minutes from the time I walked in the door! 1. Melt the butter with the evoo in a large pot. Add the garlic, and cook for 1 minute over medium-high heat. 2. Add the stock & pepper and bring to a boil. 3. Next, add your pasta (it will cook in the stock) and cook for 5 minutes. 4. Turn off the heat and stir in the cheese, cream & parsley. 5. Let sit for 5 minutes before serving. This helps the pasta soak up some of the extra sauce. I made this the other night for friends that came over for dinner. We ate it as shrimp tacos, but I imagine it would be delicious on a salad or with some brown rice & veggies. It would be great skewered and grilled in the summer time too! 1. Mix together all ingredients except shrimp. This will make your marinade. 2. 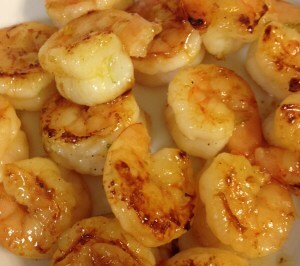 Marinade shrimp for 30-60 min & refrigerate. 3. Let sit at room temperature for 10 minutes before cooking. 4. Heat a large non-stick skillet over medium-high heat. Cook for about a minute on each side, until pink.